One of the most popular light aircraft of all time, Beechcraft's Bonanza was first flown on December 22nd 1945. This amazingly successful aircraft has been in continuous production since 1947 and is one of the few light aircraft still manufactured in the USA. A large number of versions are available, varying in accomodation, performance and even tail design, some equipped with a conventional tail instead of the distinctive V-tail design. The Model 35 was the earliest version of the Bonanza, 1,500 produced during 1947 and 1948. With the outbreak of the War of Independence in late 1947, the "Haganah" movement formed its own air arm, the "Shirut Avir" (air service). The service initially consisted of a small number of light aircraft, but the increasing needs of the war prompted the "Haganah" to search for more aircraft throughtout the world. In February 1948 Boris Senior, a former South Africa Air Force pilot recruited by the "Haganah", returned to his homeland to procure aircraft for the "Shirut Avir". South Africa was home to a large and sympathetic Jewish population which had already begun assiting the war effort and was now willing to put up funding to assist Senior. The money collected allowed Senior to purchase a number of aircraft, including a pair of de Havilland Dragon Rapides, three Fairchild Arguses and 5 DC-3s, as well as a pair of Beechcraft Bonanzas. On April 3rd the two aircraft left South Africa on the long route to Palestine, flown by Senior and Cyril Katz, another former SAAF pilot. Bad weather over Rhodesia caused the pilots to loose contact with each other and both landed at separate airfields. Katz's Bonanza was damaged upon landing and when Senior arrived the following day with a mechanic, his Bonanza was damaged as well. After a few days in Rhodesia, one Bonanza was fixed and flown back to South Africa where Senior replaced it with another example. By that time however, the South African police had begun showing an interest in Senior's actions and the aircraft was smuggled out of the country by another pilot. Senior received the aircraft in Khartoum, the Sudanese capital, and took it from there to Egypt. Hiding his eventual destination, Senior took off for Beirut but headed for the Negev desert instead, where he refuelled his aircraft before finally arriving at Sde-Dov on May 5th 1948. The second Bonanza arrived the following day, after another harrowing, malfunction-ridden flight. The two Bonanzas were quickly pressed into service. 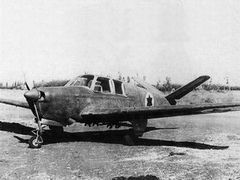 For lack of more suitable aircraft, the IAF employed many of its light aircraft as bombers and the two Bonanzas, light utility and liaison aircraft, were fitted with 2 underbody hardpoints for 50kg bombs. The aircraft subsequently saw combat on the various fronts of the War of Independence. During early May 1948, shortly after their arrival, the pair participated in operation "Macabbi" along the road to Jerusalem, while in mid May the Bonanzas flew bombing missions against Palestinians besieging Gush Ezion. On May 14th Israel declared its independence and was subsequently invaded by the regular armies of its Arab neighbors, in a bid to destroy the new born state. For the first time Israeli forces were not only confronting regular armies but also regular air forces, equipped with fighter aircraft which Israel and the IAF could do nothing against. On the morning of May 15th Egyptian Air Force Spitfires attacked Sde-Dov and managed to destroy a number of aircraft including one of the Bonanzas. On another attack later in the day one of the attacking Spirfires was hit and forced to land on a beach north of Tel-Aviv. The surviving Bonanza took off to find the fighter, and the two men on board, including Boris Senior, captured the downed pilot and his aircraft. The Arab supremacy in the air was so absolute and the distress of the IAF so great that a desperate idea was formulated to counter Arab fighters. As the IAF's fastest aircraft upon the formation of Israel, a machine gun was fitted to the Bonanza's cargo hold and a number of missions were flown to intercept Arab fighters, although these failed completely. The remaining Bonanza also participted in the attack on the Egyptian flotilla barraging Tel-Aviv on June 4th, but with the arrival of fighters in IAF inventory, the Bonanza returned to its original liaison role. Augmented by another example in the beginning of 1949, the Bonanzas continued to play this role for the remainder of the war. They were still in service during December 1952, on the way to retirement. Type: light utility & liaison aircraft. Performance: max speed - 295km/h, service ceiling - 5,200m, range - 1,200km. Weights: empty - 720kg, max takeoff - 1,200kg. Dimensions: span - 10.20m, length - 7.65m, height - 1.99m.